Suspended Edge Guide For Juki Industrial Walking Foot Sewing Machines with mounting screws. This is a combined hinged roller and straight stop adjustable guide which can be adjusted in height and raised up when not in use. This guide is especially designed to attached to the upper body of the sewing machine so that it would not interfere with the movement of the material on the flat bed. It is useful for sewing on thick leather or other heavy materials. It allows you to precisely sew on delicate corner. 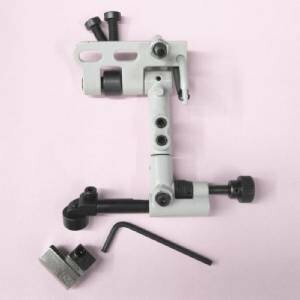 Can be attached to other leather sewing machines like Adler, Consew, Highlead, Pfaff, Singer and more but you might need to drill and tap screw hole to mount this guide to fit.